The 2016 NSI Summit was attended by over 200 installers last week who enjoyed a packed seminar programme as well as a chance to meet up with the 50 exhibitors in the main hall. 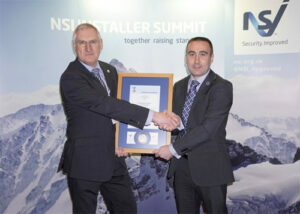 Among those who had a great day was the Stirling Electrical Services and Stirling Alarms Owner and Director Scott McLean who received an NSI accreditation medal and certificate on behalf of the company. In February this year the Stirling Alarms service was awarded approval in the Design, Installation and Maintenance of Electronic Security Systems including Access Control, CCTV Systems and Intruder Alarms by the National Security Inspectorate (NSI). “It was a proud moment for me and for all involved when we received our NSI medal and certificate from Chief Executive Richard Jenkins, in this our 20th year in business,” said Scott.